The Summer NAMM show will see the addition of the Black Magic finish to the Tama line of Starclassic Performer EFX Drums. Said Paul Specht of Tama (who obviously has been reading too many Harry Potter books): "Starclassic Performer EFX's new Duracover finish, Black Magic, will cast a spell on your drum customers, and enchant your accountant with columns of figures that magically appear in the black." 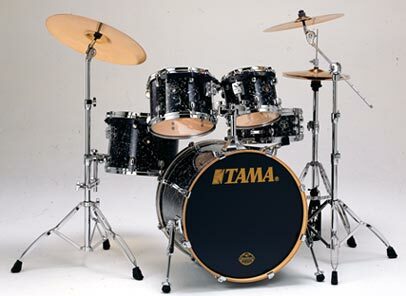 Tama Starclassic Performer EFX drums feature shells of 100% birch (6ply 6mm toms and floor toms/7 ply 7mm bass drums) wrapped in five different Duracover finishes including the new Black Magic finish. Starclassic Performer sets include the Star-Cast mounting system, die-cast hoops on the toms and snare drums and come with the new Tama Roadpro stands.